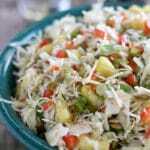 Pineapple Coleslaw with jalapeno and red bell pepper is just what you need to liven up your summer cookout! An easy, make ahead dish, you can throw this together a couple of days before you need it and just store in the refrigerator. 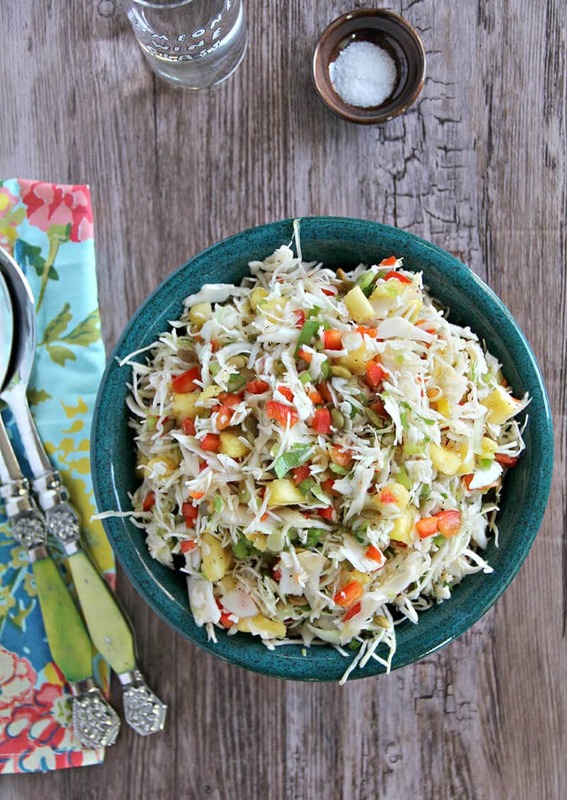 All you need for this Pineapple Coleslaw is a bag or a few cups of shredded cabbage, chopped pineapple, minced jalapeno, and chopped red bell pepper. The dressing is simple with apple cider vinegar and brown sugar. It’s easy and versatile and a great side for any grilled meat. Coleslaw is one of those foods that most people feel pretty strongly about—they either love it or hate it. 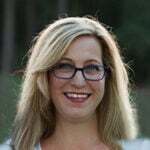 I’m in the love camp, but I have preferences that can quickly put me in the hate camp. For starters, I don’t like coleslaw that’s too mayonnaisy. Yes, mayonnaisy is a word, at least when referring to coleslaw. Or chicken salad. I prefer coleslaw that’s vinegar based, but with a little something in there to give it a hint of sweetness, like chopped apples, or pineapple like I’ve used here. I also do love coleslaw that’s mayonnaise-based as long as the cook has shown some level of restraint with the soupiness. I like a little sweet flavor and sometimes a little heat added from peppers, but not overpowering onion flavor. Our family always serves coleslaw with our barbecue or burgers. It’s a Southern staple, much like potato salad or pimento cheese. 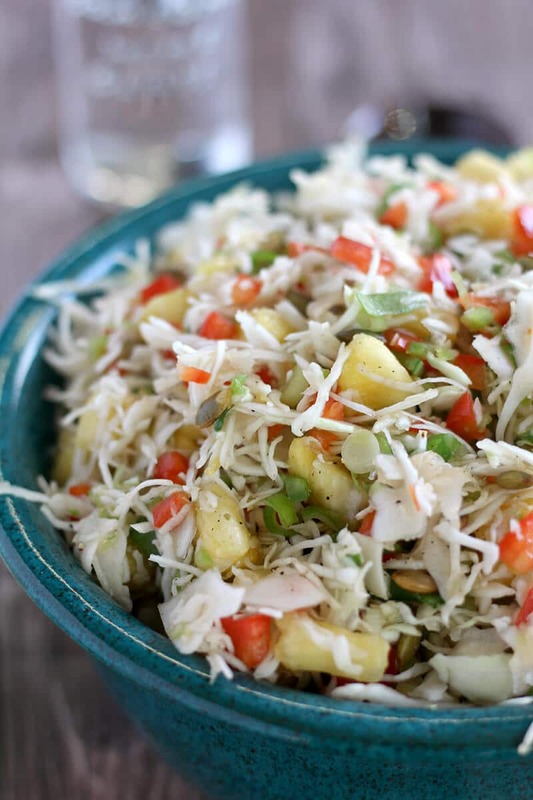 What’s your go-to summer side dish? You can shred some cabbage in the food processor or with a box grater if you like, but I usually take the easy route and just grab a bag of pre-shredded cabbage. For this recipe, I prefer the plain cabbage and not the kind that’s mixed with grated carrots. Next chop some fresh pineapple, fresh jalapeno, scallions, and red bell pepper. I found some cumin-toasted pumpkin seeds so I threw those in too. You could also add some chopped baby bok choy for a good crunch. The dressing is a simple blend of apple cider vinegar and brown sugar. 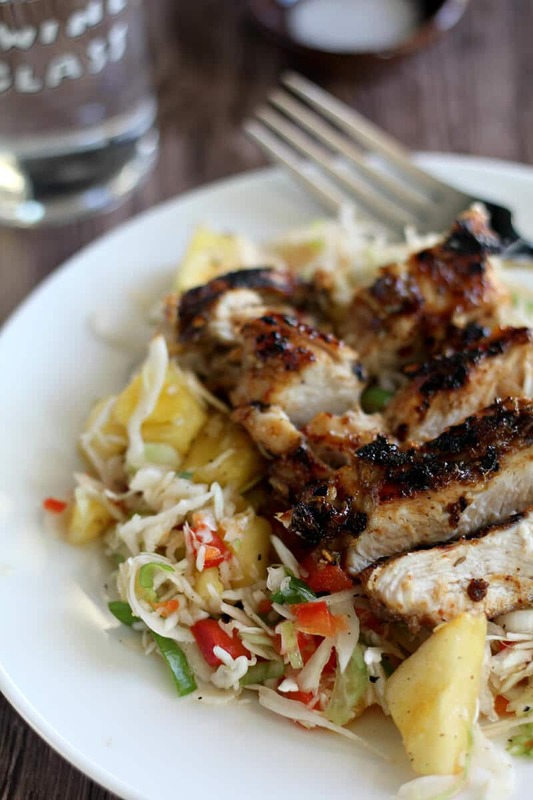 I served this Pineapple Coleslaw with Jerk Chicken but it’s also great with Southern Pulled Pork or Roast Chicken. What’s your favorite coleslaw recipe? Are you in the mayonnaise camp? Or vinegar dressing? 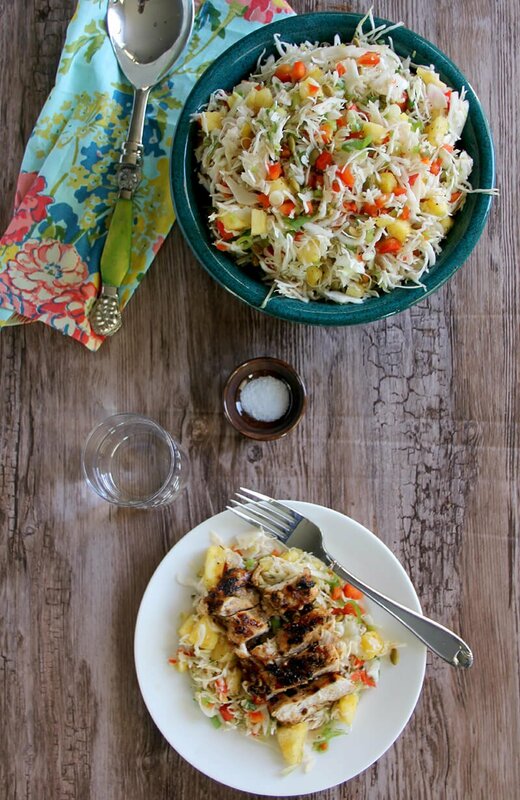 Pineapple Coleslaw with jalapeno and red bell pepper is just what you need to liven up your summer cookout! An easy, make ahead dish! Mix cabbage with chopped vegetables and pumpkin seeds in a large bowl. Gently stir in dressing. Add salt and pepper to taste. Refrigerate until ready to serve. Whisk brown sugar into vinegar until well blended. Can substitute 2 cups chopped baby bok choy for 2 cups cabbage. Coleslaw can be made ahead up to 1 day.